We spent the entire week of Thanksgiving in FL with Mama. It's great to see her, as well as old friends, and of course the bzillions relatives who gather together to celebrate Thanksgiving. According to the official family head-counter we had 60 there this year. That's actually a little low for us! We also had some family time together. We visited Hillsborough State Park & had a delightful walk along the Hillsborough River. It's small, but crystal clear river winding through the woods on it's way south to Tampa. 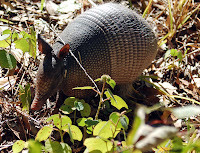 The funniest thing about this state park was all the armadillos. There were 1/2-grown armadillos everywhere! Along the road inside the park, in the woods next to the trails, trotting around the playground/picnic area. I've never seen so many....well, let me rephrase that, I've never seen so many LIVE armadillos. I'm quite use to seeing them dead on the highways in FL. We call them 'possum on the half-shell!' But these little guys were very much alive and lively. Riley REALLY wanted to play with them. Despite life's problems, we really do have a lot to be thankful for. God has blessed our family beyond words. We have family that cares about each other & gathers together in joy - no drama. We have a beautiful world to explore. Its different enviroments are a testament to God's wonderful creativity. We have the Hope and Joy of the Season. The Reason for the Season is so beautiful. It's not about tinsel, garland, ornaments & things. I know we all enjoy these things ~ the bright lights, pretty bows & presents, but it's really about Love. While things may be tight and we all moan & groan about the economy, politics, or the price of things - we are still thankful for this country and it's freedoms. God has blessed us. NOW we know what Bobbin, Ethel and Riley do when we aren't home. I thought I heard some dancing feet stomping around in the middle of the night, too! get them extra treats for Christmas.